Adarsha Vidyalaya Graduate Teachers jobs. These vacancies are purely contract basis only. Renewal for this RMSA Assam Graduate Teacher jobs will be based on candidates performance. 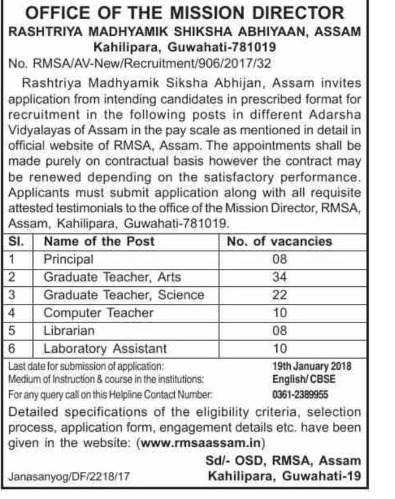 Interested candidates may apply in a specific format for this RMSA Assam Graduate teacher Arts, Graduate Teacher Science, Computer Teacher, Librarian, Laboratory Assistant jobs. Last date to reach the application form to "Office of the Mission Director, RMSA Assam, Kahilipara, Guwahati-781019 is 19-01-2018. These vacancies are for the Assam Adarsha Vidyalayas of CBSE English Medium Schools. 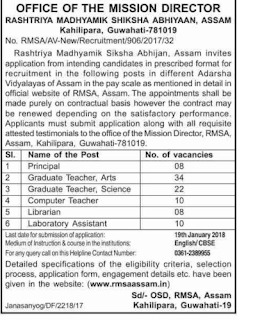 More information for this RMSA Assam Adarsha Vidyalayas Compute Teacher, Principal, Graduate Teacher Arts/Science jobs age limits, qualifications and other details are given below. There are total 92 posts in this RMSA Assam Adarsha Vidyalaya Schools jobs. The above given qualifications are for your knowledge only. It may vary while comparing with the RMSA Assam notification. Candidates selection will be through Written exam or merit in educational qualifications or Assam SET Marks. 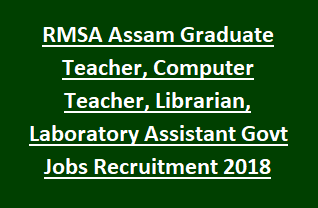 Candidates who are having required qualifications they can apply online for this RMSA Assam recruitment of Graduate Teacher, Computer teachers, Laboratory Technician, Principal and Librarian. Application form and other recruitment details are available in www.rmsaassam.in.